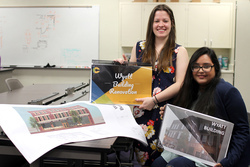 As part of a course project, Stephen F. Austin State University seniors Olivia Bufalini and Issamar Jones, interior design majors from Houston, helped their classmates create renovation proposals for the historical Mahdeen-Wyatt Building in Nacogdoches. Students conducted research, surveys, and site, budget and building analyses, and constructed renderings of their design ideas. NACOGDOCHES, Texas - History and innovation merged in a new project between Stephen F. Austin State University interior design students and members of the Charles and Lois Marie Bright Foundation and City of Nacogdoches. Since fall 2017, interior design students have been working to create renovation proposals for the historical Mahdeen-Wyatt Building, located on East Pilar Street. German architect Diedrich Rulfs designed this three-story building in 1918, and it was constructed with locally made bricks from the banks of Banita Creek, according to the 2007 national register information from the SFA Center for Regional Heritage Research. In its heyday, the Mahdeen Company used the building's basement and third floor to produce hair tonic, while the first and second floors were used as a car dealership, according to research from the SFA Center for Regional Heritage and Research. The Bright Foundation is in the process of purchasing the building. Students in a course taught by Sally Ann Swearingen, SFA associate professor in the School of Human Sciences, were divided into three teams to research and create proposals to breathe new life into the building. The class worked with city officials, the Nacogdoches Economic Development Corporation, Nacogdoches Main Street program, engineers, and security and information technology professionals. "Each year, the capstone interior design course takes on a project that would either benefit the community or SFA. This year, I selected a large-scale empty building downtown that would benefit everyone," Swearingen said. Teams conducted surveys and site, budget and building analyses. This spring, students devoted their efforts to compiling their research and constructing renderings of their design ideas. "Students utilized the tools they have learned from all their courses," Swearingen said. "This project assists students in understanding the entire process an interior design or architectural firm would go through to sell the client on a proposal for a building." At the end of the spring semester, teams presented their proposals to Stanley Jones, Greg Williams and Bill Early from the Bright Foundation; Brian Bray and Hanna Andersen from the City of Nacogdoches; and Judy McDonald, former Nacogdoches mayor and former NEDCO director. "This project has two purposes - to teach or reinforce the design process through a possible real-life project and helping the community with ideas of what could possibly go into the building with evidence-based design," Swearingen said. Based on their research, one team suggested turning the first floor of the building into a retail space that includes a shop, restaurant, bar and a facility for painting parties. The team also proposed renovating the second and third floors as luxury apartments. "We wanted to keep the historical integrity of the building," said Olivia Bufalini, senior interior design major from Houston. "Our research showed there is a need for more areas to socialize downtown. Our plan seeks to make the building efficient, sustainable and fun for visitors." Students visited Georgetown, Texas, which is one of the busiest and most profitable downtown districts in the state, to see what makes them so successful, Swearingen explained. The class also toured Waco's spice market, and each team chose another downtown area to explore. For more information about SFA's interior design program, visit sfasu.edu/hms/103.asp.